GoMedia to showcase the latest technology about onboard entertainment and personal passenger information to passenger’s own devices. September 2018, London: GoMedia, Europe’s leading onboard infotainment systems developer, is announcing that next week, at InnoTrans 2018, it will showcase the latest technology of onboard entertainment and personal passenger information delivered direct to passenger’s own devices. GoMedia will make its debut at InnoTrans. Two months ago, GoMedia announced the latest technology in its own DRM protection system. It has been signed off by major Hollywood studios and made its debut on Greyhound buses. “It is exciting to showcase our service offering at InnoTrans, the world’s largest Rail show. We have live services already with some amazing clients such as Eurostar, Virgin Trains and Greyhound buses. It is exciting to showcase our latest developments to the rest of the world.” Said GoMedia Managing Director Roger Matthews. “Technology is developing fast and we are now at a point that we really can deliver personal experiences to passenger’s own devices. 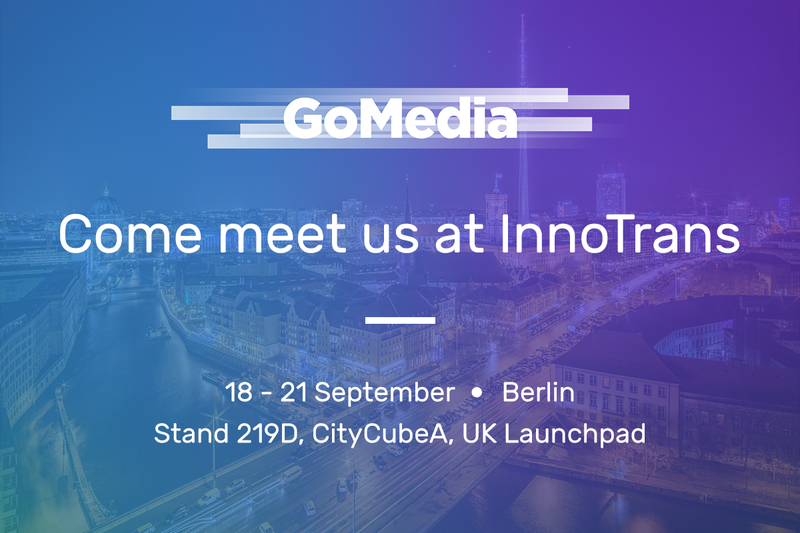 At InnoTrans 2018 in CityCube A, Stand 219D, GoMedia will be able to assist you in the future of on board entertainment and personal passenger information. GoMedia is an agnostic service and can be implemented on most of your current hardware, some of our partners are for example: Icomera, Nomad Digital, Klas Telecom, Cisco and McLaren. attendance, please visit the InnoTrans 2018 website.